1740-1812. 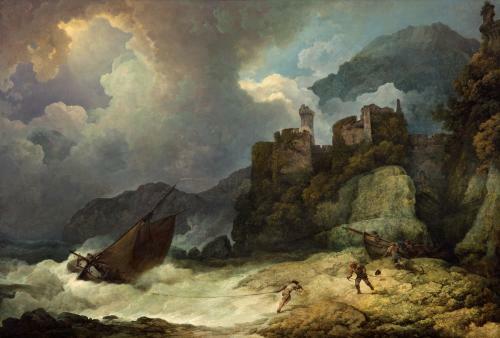 Trained in France, Philippe Jacques de Loutherbourg started his career in England as a scenery painter for the famous actor David Garrick’s theatre. He gained an international reputation for his innovation. He experimented with artificial light and painted transparencies, where a scene is painted on glass and has a light shone behind it. This inspired artists like Gainsborough and Reynolds. De Loutherbourg became a successful landscape painter, but his style remained theatrical. His flamboyant pictures influenced the Romantic movement.